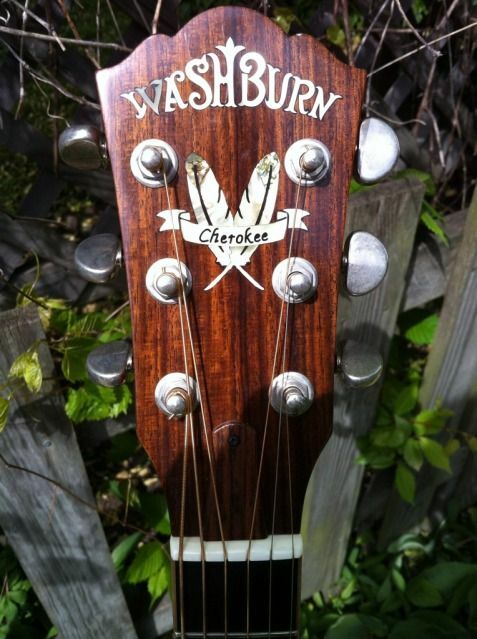 I've found this Washburn with a serial number beginning in 00, but the archives mention that Cumberlands began in 2001. I also haven't seen any photos yet with all-gold Grovers on the Cumberland, which this one has. Are there any others out there like it? I think the Cumberland series started with the J-28 SCE. It was introduced in 1995, according to the archives. I'm looking at a 1996 Washburn catalog, page 16, at the mottif on the J-28 SCE. Its identical to the J-28SDL right down to the word Cumberland. The item description calls it a Cumberland, also. I bought a used J-28 SDL-12 , 6 months ago (the only nice acoustic that I own), it has gold tuners and buttons on it and was made in 2000.
headstock, 3-per-side tuners, available in Natural finish, mfg. 2000-present. EQ controls, Equis Gold preamp, available in Tobacco Sunburst or Natural finish, mfg. 1995-2000. This model is not the Cumberland that is similar to the other J28 SDL models. Seems I've come across a 95 Cumberland, but with no electronics. Everything I've found on the search indicates that these only came with. Anyone have experience to the contrary? Seems like a pretty nice guitar, crown inlays, etc. Who's played one that can offer a review of sorts? Didn't Rocket have one of these that he'd upgraded with some appointments? Yes Rocket did have one. I entertained the idea of buying it, but did not. I've played a different one and loved the look and sound. Lot's 0' volume but very balanced. Bright, bold tone. For me the jumbo size is just to much of a wrestling match. If you can handle the size then it's a terrific guitar. Keel, I remember Rockets, isn't that the one that he had changed the tuners and added a pickguard? I was certain, at the time, that that was a solid wood guitar. The descriptions that Pike has listed here indicates laminate, if I'm correct. Not the end of the world of course, it's about sound, but that balanced volume is exactly what I had in mind in considering this style. You've played a mahogany LarriveÃƒÂ©, as I recall, so you know what I'm working with. Beautiful, but subtle sound. Great fro fingerpicking, but not a well suited to strumming accompaniment. I may have to take a look.